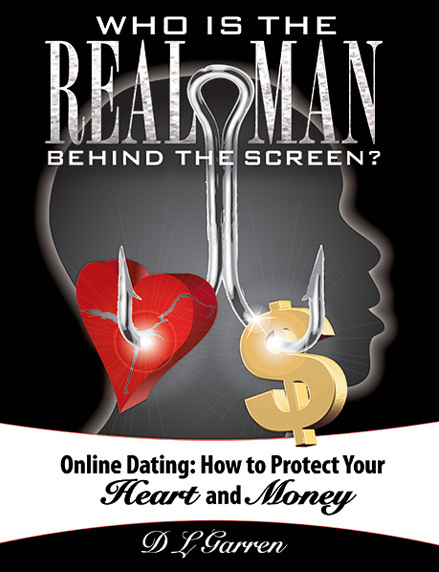 Home » Books » First-hand insight and information to keep your heart and money safe when online dating! In this book you will read intimate chats, emails, text “red flags”, “language”, “formats” and “scam stories” told from beginning to end that the scammers employ. You will learn how scammers gain your trust to swindle your money; the inner workings of the scamming world…told by scammers themselves, how to identify tools of the trade scammers use to fool you, and the dangers entwined with online dating. There are over 90 red flags. Without knowing how to recognize the “red flags” of scammers, it is not “if” you will be scammed, it’s “when”. DL Garren draws heavily from her chats with twenty-six scammers, three of whom revealed their real identities, and became her inside sources and three others who verified the facts she was provided. They taught her the inner workings of the “Romance Scam” and helped her navigate safely through her research. Now, she is teaching you so you can be safe!